John Tonelli won 4 Stanley Cups with the Islanders. 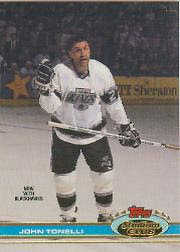 He scored 836 points in 13 NHL seasons. He is well remembered by teammates, fans, and opponets for his tenacity and his ability to come up big in clutch situations. But the first thought that comes to my mind when I think of John Tonelli is this card (technically a Blackhawks card) from 1991-92 Stadium Club, in which he reminds me of the pissed off old man down the street who keeps all the baseballs that go in his yard. DAMN KIDS!!!! He shouted, shaking his fist in anger and frustration. 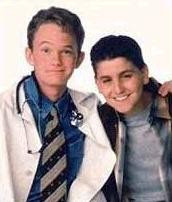 Also, for some reason, this card always reminds me of guy who played Doogie Howser's buddy Vinnie in Doogie Howser MD. Sorry, John. You were a fine player, and I'm sure a nice guy, but these images come to my brain when I hear or see your name. Blame it on the Topps photographers.